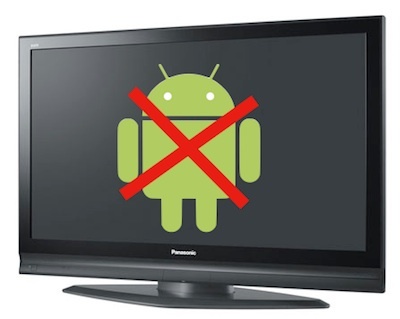 Google, we know, loves to extend its grasping business tentacles in as many directions as possible, so the company’s execs will be interested to learn of this particular G-fail: Panasonic is rejecting Android for TVs, citing expense. More and more TVs are going high-tech, and there are enough experiments underway to suggest that the average TV is going to become smarter and Net-enabled, possibly to maximize the utility of set-top box Net TV show and movie content. And Panasonic is the fourth biggest TV maker in the World, making this even more of a stinging blow to Google. But wait. Android–which would be perfect for the sort of simple to medium-complex tasks that a smart TV would require–is an open-source OS that’s completely free to buy or use. So on what grounds is Panasonic saying that Android TVs would be too expensive to make? According to Robert Perry, Senior VP of the U.S. division of Panasonic, the cost of all the supporting electronics, particularly the CPU, which would probably come from Intel, is too high. The industry would have you believe this is logical, as Samsung recently made similarly disparaging noises about Android TVs. But does this really add up? After all, Android-powered cell phones can be amazingly cheap, and they have a whole bunch of electronic parts that an Android TV wouldn’t need. The build costs of using Intel chips also hasn’t affected the netbook industry much, and Android powered netbooks and MIDs are among the lowest priced out there. The Atom was designed for this sort of task, and Intel priced it so low that it kicked off the whole netbook phenomenon. Adding, say, a hundred dollars or so to the build cost of a TV set that’ll go on the shelves priced over $1,000 just wouldn’t seem prohibitive–particularly since you could actually sell the sets for more, thanks to their added Net and app powers. The skeptic may therefore consider that something else is going on. Is it these big players in the TV industry being super-cautious of the Google monster? Are they making preliminary moves to prevent Google from slipping into a position of power in the multi-billion dollar TV game, which would then let it scoop up more power in this new market? It’s possible. To keep up with this news and more like it, possibly on your Net-enabled TV, follow me, Kit Eaton, on Twitter. That QR code on the left will take you to my Twitter feed too.